The Delhi police has caught hold of a couple that had cheated an Archies Gallery’s owner in the Connaught Place area here last month. The couple, reportedly, followed the modus operandi of protagonists in film ‘Bunty aur Babli’ that had released a few years ago. Twenty-eight students pursuing hospital management (batch 2008-10) from Delhi Business School (DBS) in Badarpur have been sitting on dharna for the past two weeks. The doctor students began the protest after they realised that Eastern Institute of Integrated Learning in Management, a Sikkim-based university, under which DBS had enroled them, was not authorised to conduct the course as per the UGC regulations. A Ghaziabad youth, a resident of Shipra Sun City in Indirapuram, has been tested positive for swine flu. The victim had arrived in Ghaziabad from Egypt, via Abu Dabi, on June 15. A health department team had examined him on his arrival. The city is reeling from scorching heat. Several cases of heat stroke are reported almost every day. Schoolchildren and office goers are worst affected. Doctors claim that such cases are common these days. In keeping with the Municipal Corporation of Delhi’s (MCD) aim of expanding the green cover of the Capital ahead of the Commonwealth Games in 2010, the civic body has set a target to develop seven lakh plants for the beautification of stadiums and roadsides in Delhi. The south district police today arrested Rakesh Kumar, alias Raka (22), an interstate wrestling champion (84 Kg, freestyle, 2007), and a sharp shooter with Krishan Pehlwan gang. Rakesh was wanted in several cases of murder in Haryana and Punjab. A group of youths today alleged that they were manhandled and beaten up by bouncers of a discotheque in the Rajouri Garden area of West Delhi today. According to the police, the incident was reported at around 3:30 p.m. today. The Delhi High Court has dismissed the plea of a group of senior journalists, who challenged the government’s move asking them to vacate their allotted houses, ruling that the accommodation was not for an unlimited period. There are more than 12,00,000 cases pending in the five district courts of the Capital which are fighting hard to clear the backlog. According to the latest figures available on the website of the district courts, there is an increase of 68 per cent pending cases since 2007. Be it public-spirited people, environmentalist or voluntary groups, everyone has the right to raise a voice against environmental damage and be considered an aggrieved party, says Delhi High Court. New townships will be set up along the Yamuna Expressway in Aligarh and Agra. The administrative officials of both the districts have been directed to acquire 500-hectare land in each district for the purpose. It was yet another hot and humid day for Delhiites, with the maximum temperature reaching 43° Celsius, four notches above the normal for this time of the year, while the minimum temperature settled at 28.8° Celsius, reported the Met department. An 18-year-old girl committed suicide in the Khayala area of west Delhi yesterday after her father scolded her for having an affair with a boy. The police said Vinita was seeing a boy for the last few months. But when her father got to know this, he rebuked her. In two separate incidents here, houses of two software engineers were robbed of cash, jewellery and other valuables worth Rs 17 lakh. The couple from Darjeeling was arrested today by the New Delhi district police. The accused have been identified as Sushant Dhillon (38) and his wife Kajal Dhillon (28). Sumit Pal Soni who runs an Archies gallery in Connaught Circle alleged that Sushant Dhillon had come to his gallery on May 24 and had said that he manufactured plastic photo frames. Sushant had offered to sell photo frames to the complainant at Rs 18 each. When Sumit refused to buy the frames Sushant, reportedly, insisted to display his products at Sumit’s gallery without any charges. Sumit agreed to this. Sushant left some pieces in the gallery. According to the police, Sushant’s wife Kajal came to Sumit’s gallery after two days and showed interest in the photo frames that Sushant had left there. “She ordered 2,000 photo frames and agreed to pay Rs 34 per piece. She paid an advance of Rs 5,000 to Sumit Pal Soni who later asked Sushant to supply more frames. Sumit also gave Rs 31,000 to Sushant to supply more photo frames,” said a police official adding that Kajal did not turn up at the gallery to get the goods that she had ordered. Later, Sumit realised that Sushant and Kajal had cheated him. He suspected the two might be working in connivance and lodged a police complaint. The call details of Sushant and Kajal were analysed and a raid was conducted at their residences leading to their arrest. It was found they were a couple. They had struck a similar deal for 1,000 photo frames at Rs 28 per piece with Manoj Malik of Archies gallery, Modern Agencies, Jwala Heri Market. Kajal Dhillon had paid an advance of Rs 3,000 to Malik. Twenty-eight students pursuing hospital management (batch 2008-10) from Delhi Business School (DBS) in Badarpur have been sitting on dharna for the past two weeks. The doctor students began the protest after they realised that Eastern Institute of Integrated Learning in Management (EIILM), a Sikkim-based university, under which DBS had enroled them, was not authorised to conduct the course as per the UGC regulations. Students feel DBS has betrayed them as they had taken bank loans to pursue the course and have already invested a year. “Can there be a bigger betrayal?” questions a student. Dr Mukesh Sharma, a bachelor in dental surgery (BDS) pursuing hospital management from DBS, said the students realised something was amiss when the admit cards were issued by DBS and not by EIILM and the first semester exams were conducted on DBS campus instead of EIILM. However, when the students questioned DBS authorities in this regard, the authorities not only refused having anything to do with EIILM but also promised them to provide degrees from another university. “First the authorities said they have got affiliation for the course from some Bhartiyar University and now the latest name doing the rounds is Punjab Technical University. We would be fools to believe them,” said Sharma. According to another student, Dr Namit Tomar, there is no fixed fee structure under which the students are charged by DBS and several discrepancies are visible in their fee receipts. “We have been charged as per the whims and fancies of DBS. While some have paid Rs 8,000 as tuition fee, others were asked to pay Rs 6,500. However, the round-up fee would be around Rs 1.5 to Rs 1.85 lakh for all of us. We do not come from affluent families and almost 90 per cent of us have taken bank loans to pay the fee. In return we would get degrees which are not valid,” rued Tomar. However, when DBS director Divya Rajput was asked about the grievances of students, she said they were protesting after being provoked by a teacher who had left the institute. “They have been brainwashed by this gentleman who has resigned from DBS and has joined some other college. All problems have been created by him. He has left us in the lurch,” added Divya. When asked why the students were enrolled in the name of EIILM when the UGC prohibited it to conduct courses outside Sikkim, Divya refused to comment. She even refused to talk about compensating the students. A 15-year-old boy in New Delhi tested positive for swine flu on Sunday. The teenager had arrived in Delhi from New York on June 17 and got himself admitted at an identified facility two days later. A Ghaziabad youth, a resident of Shipra Sun City in Indirapuram, has been tested positive for swine flu. The victim had arrived in Ghaziabad from Egypt, via Abu Dabi, on June 15. A health department team had examined him on his arrival. According to chief medical officer A.K. Dhawan, this is the first case of swine flu in Ghaziabad district. The victim, Ashish Singh (28), is an engineer with the merchant navy and is based in Egypt. His parents live in Krishna Garden in . Dhawan said Ashish was admitted to Delhi’s Ram Manohar Lohia Hospital on June 17 after he complained of headache, fever and pneumonia. His blood sample was tested at NICD centre after which it was confirmed to be a case of swine flu. The health department has also sent a team of doctors to his house to examine members of his family as well as neighbours. According to doctors, the symptoms of swine flu are cough, sour throat, high fever, severe pain in chest, watery discharge from nose and eyes, loose motions and bodyache. The symptoms should not be ignored as the swine flu virus spreads from one person to another very fast, suggest doctors. Avoid going out during daytime. Make an effort to stay in cool atmosphere. Avoid caffeine and alcohol as much as possible. Use umbrellas or scarf while going in the sun. 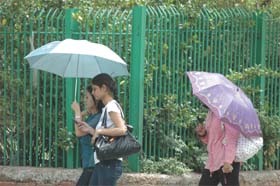 The city is reeling from scorching heat. Several cases of heat stroke are reported almost every day. Schoolchildren and office goers are worst affected. Doctors claim that such cases are common these days. Usually people do not take precautions while going out in the sun. Heat cramps, exhaustion and heat stroke can bring about an irreversible coma, even death, warns Dr Raghav Sinha, a child specialist. Heat cramps can be uncomfortable, but not life threatening while heat stroke needs immediate attention. Ignoring heat cramps, however, can bring about the progression of other serious heat-related illnesses. Those who do not cover themselves with cotton clothes and umbrellas while going out in the sun can fall prey to a number of problems. Diarrhoea tops the list. It is caused by excessive heat produced in the digestive system as a result of improper eating habits and impure water. To save oneself from this problem, it is advisable to take liquids and semi-solid stuff like soups, curd and its products, lime juice and above all, lots of water. Heat syncope involves fainting after prolonged standing in the heat. Removal from the heat conditions and use of slightly salted liquids will also help, advises Dr Gyanendra Agarwal. Besides heat cramps, another problem is seen in adults who sweat profusely, but do not take fluids with enough salt. Cramps occur in heavily worked muscles especially when the person is relaxing. Cold shower may trigger cramps. Intake of salted liquids or intravenous saline will give rapid relief, say health experts. Heat exhaustion is a common problem with most people in summer. The patient suddenly experiences weakness, nausea and headache. The hot humid weather can cause heat strokes. Experts say it may be induced by some medicine taken as a treatment for allergy, blood pressure or mood elevation. In this condition, body temperature shoots up and may rise to even 106 degrees. The skin becomes red, hot and dry. The saying “Prevention is better than cure” applies more to heat stroke than to any other disease. A glass of cold lemon juice with a pinch of salt makes an excellent drink to ward off heat stroke. Applying cold compresses to the forehead, cold sponging all over the body, mud packs over the abdomen and forehead and rubbing the feet and legs of the victim with a wet towel bring relief, say health experts. Plenty of seasonal fruits such as watermelon and muskmelon should be eaten. Salads, fresh vegetables curd, buttermilk and lemon juice should also be a part of regular diet, advises fitness expert Shalini Das. Besides, the corporation is also developing six landfill sanitary sites into green areas with trees, ornamental plants and shrubs. The chairman of the garden committee of the MCD, Ved Prakash Gupta, said that the project would be implemented before Commonwealth Games. The work on three landfill sites, which include Bhalaswa, Ghazipur and Okhla, has been completed, whereas the proposed sites for a green cover in the surroundings are Narela, Bawana and Bakarwala. “The MCD has a target of planting over two lakh trees this year. But due to delayed monsoon, the plantation has not started yet. The trees would be planted in parks, on roadsides, banks of drains, in municipal schools and various municipal institutions. It was also decided to re-develop existing parks, in fact many parks have already been re-developed,” he said. The civic agency’s green drive also includes planting of saplings, developing parks and gardens and beautification of roundabouts to increase the green cover in Delhi. Gupta said that beautification would also be done on road sides, under the bridges and over the traffic circles. “The project of planting plants in the open areas under the bridges has been started in the areas of Moti Nagar, Janakpuri and Inderlok. We would be inspecting these sites tomorrow,” said Gupta. The MCD had also proposed to carry out development and landscaping of 304 parks at a cost of Rs 3.62 crore, which was sanctioned from special escrow account. To facilitate the public, especially the senior citizens, 10,000 new steel benches would also be installed in parks. Further, for improvement of gardens and nurseries and other works related to the horticulture department, 119 new machines, including tractors, electric lawn mower and hedge trimmers, have been purchased at a cost of Rs 1.8 crore. The garden committee members said 200 roundabouts would be beautified and fifty-four roads had been identified for landscaping. “Ten tractors, for which orders were placed last year, would be added to the fleet soon. This would enable the horticulture department to improve and maintain more green areas as well as provide ample irrigation facilities in the Capital,” he added. According to H.G.S. Dhaliwal, DCP (south), Rakesh, a key member of the gang, was arrested from near McDonald restaurant at PVR, Saket, after an informer tipped the police about his movements. According to the police, as of now Rakesh has confessed to be involved in two murders in Haryana and Punjab. “He killed one Mahinder of Ritoli village (Rohtak) in December last year after he refused to support his family during a court case. Rakesh also disclosed that he had killed one Padam Singh in Fatehgarh, Punjab, after Padam got to know that one of Rakesh’s accomplices, Pradeep, had an illicit relationship with his wife,” said Dhaliwal. Rakesh is a resident of village Ladrawan in Jhajjar (Haryana). 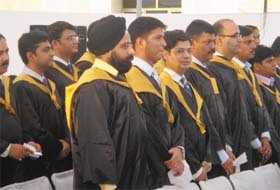 He has studied up to Class XII from Golden Valley School in Bahdurgarh, Haryana. After school, he took admission in BA (pass course) at Government College in Bahdurgarh. He recently appeared for his final year examination. Rakesh’s father is the sarpanch of the village and has a very good influence in the nearby areas. During his school days, he got interested in wrestling and started practicing at Chattarshal Stadium. In 2006, he won bronze medal in the Senior State Wrestling Championship. In 2007, he won gold medal in the same championship and became the state champion. The same year, he also won bronze medal in the Rajiv Gandhi Gold Cup Championship. It was during this period that he fell into bad company and got in touch with some local criminals who were members of Krishan Pehlwan gang. Later, he also joined the gang. A group of youths today alleged that they were manhandled and beaten up by bouncers of a discotheque in the Rajouri Garden area of West Delhi today. According to the police, the incident was reported at around 3:30 p.m. today. The incident took place when eight to 10 youths were dancing at Play Restaurant & Bar in the Rajouri Garden area. One of the youths said they accidentally collided with a person on the dance floor while dancing. “We apologized to him but, suddenly, eight to 10 bouncers came and started hitting us. We were thrown out of the pub and were badly beaten up,” he alleged. He added when we reported the matter to the police, the bouncers were taken to the police station but no action was taken against their leader. Meanwhile, the police has denied their allegations. A police official said the eyewitnesses also did not support the youths and they have not filed a complaint in this regard yet. “We have not registered any case in this regard yet. The youths have not even suffered any injuries,” added the official. A division bench of Justices Sanjay Kishan Kaul and S.K. Mishra, in a recent ruling, dismissed the plea of B.K. Mathur and Aribinda Ghose along with other journalists and slapped a fine of Rs 5,500 each for illegally occupying the premises for seven years. The court also dismissed the petitioners’ attempt to link the issue of their occupation with government accommodation with freedom of press. According to the petitioners, the government had promised in its guidelines for press that all accredited journalists would be given a government accommodation in the Capital if they did not have any house of their own here. The guidelines were later amended to make all those given accommodation having to pay a nominal rent to the government. The petitioner contended that since they were accredited journalists, they should be allotted the accommodation and the government’s move asking them to vacate the premises was unfair. The appellants claim the government found that such journalists and cameramen were rendering useful and valuable service to the society and could, thus, be treated as a class in themselves, entitling them to government accommodation at subsidised rates. The petitioner contended that since the accreditation was renewed on a yearly basis, the occupation of accommodation was directly linked to such accreditation and till the accreditation was withdrawn, the accommodation could not be withdrawn. There are more than 12,00,000 cases pending in the five district courts of the Capital which are fighting hard to clear the backlog. According to the latest figures available on the website of the district courts, there is an increase of 68 per cent pending cases since 2007. At present, as many as 12,02,130 cases are pending, among which, as many as 5,08,660 cases relate to dishonoured cheques. The number of cases pending in Delhi courts last year stood at 9,42,429. The failure to fill the vacancy of judges has been one of the reasons for slow disposal of the cases as the data provided by the apex court shows that out of the 591 posts, 226 were lying vacant till the beginning of this year. The growing pendency of cases in the lower courts in the Capital has also drawn the attention of the Delhi High Court, which has asked the judges of the trial courts to dispose of them in a time frame of three years. The increasing figure of pendency in lower courts has been in contrast to the efforts taken by the Delhi High Court and the city government which have been regularly holding evening courts, lok adalats and promoting alternate dispute redressal mechanism in the form of arbitration and conciliation. In the ruling last week, the court made it clear that the law is accessible and same for all and set aside an order of the National Environmental Appellate Authority (NEAA). The NEAA had dismissed environmental activist Prafulla Samantra’s plea against the setting up of an alumina smelter plant in Bhurkamunda village in Jharsuguda district of Orissa, stating he is not an aggrieved person in the case. Samantra, president of the Orissa unit of Lok Shakti Abhiyan, an organisation dedicated to social and environmental causes, challenged the order in the high court. Setting aside the NEAA order, the court said, “If standing before a special tribunal created to assess the impact of projects and activities that impact potential threats to the environment is construed narrowly, organisations working for the betterment of the environment whether in form of NGOs or otherwise would be effectively kept out of the discourse that is so crucial an input in such proceedings. The court asked the NEAA to consider the plea of the environmental activist and slapped a fine of Rs 50,000 on Vedanta Alumina Limited, which is setting up the alumina smelter plant in Orissa. New townships will be set up along the Yamuna Expressway in Aligarh and Agra. The administrative officials of both the districts have been directed to acquire 500-hectare land in each district for the purpose. They have been asked to submit proposals for land acquisition to the state government within 15 days. Chairman of Yamuna Expressway Authority Lalit Srivastav thas asked the concerned officials to speed up the process of acquiring land and pay compensation to farmers whose land would be acquired for the purpose. Srivastav said that it was urgent to develop the Yamuna Expressway and all obstacles in the way must be removed. He further said that it would not only lead to the development of villages but would also expand employment opportunities for farmers. Lalit Srivastav said as of now a town had been planned in Greater Noida along the Yamuna Expressway. Now, it has been decided to set up towns along the Yamuna Expressway in Aligarh and Agra. The humidity level crossed 44 per cent, while the minimum was 30 per cent. According to the Safdarjung meteorological department, the city will have to bear the scorching heat for some more days as the monsoon is expected arrive late in the city. “The monsoon will reach Delhi only around July 1,” said an official of the department. Till then, due to the heat wave condition prevailing in the city, the temperature would remain around 42° Celsius and there would be no rain for a few more days, added the official. An 18-year-old girl committed suicide in the Khayala area of west Delhi yesterday after her father scolded her for having an affair with a boy. The police said Vinita was seeing a boy for the last few months. But when her father got to know this, he rebuked her. “Yesterday, Vinita was scolded by her father when he came to know about the boy. It was a normal thing for any father to do in such a circumstance, but the girl got upset and hanged herself from a ceiling fan around 4.30 pm,” said the police. The police has recovered a suicide note from her, in which she had written that she did not want to see her father unhappy and so was taking the extreme step. Vinita had left studies after she passed class XII last year. Her father runs a garment shop in the area. In the first incident, Atul Tyagi, a software engineer who runs his own business and is a resident of Niti Khand in the Indirapuram area of Ghaziabad returned home from an outstation visit to find that his front gate lock had been broken and robbers had decamped with jewellery, cash and other valuables worth Rs 15 lakh, the police said. In the second incident, the house of another software engineer Manish Gupta, also a resident of Indirapuram, was robbed of jewellery and cash worth Rs 2 lakh when he too was out of town, the police said.